Sarah Palin | Something should go here, maybe later. Yep, and I can see that burn mark all the way from New Zealand. 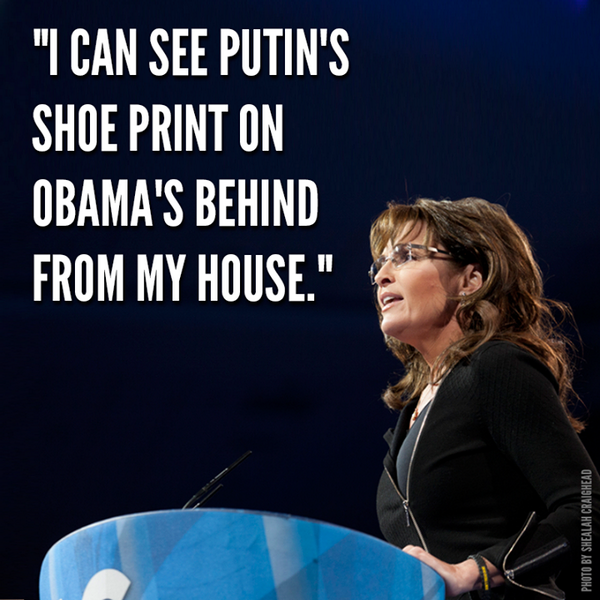 Liberals: repeat after me, “Palin may be stupid, but I should check my facts carefully before I say so“. Yet again, Palin has said something that has been taken as proof of her stupidity, but on close examination has actually proven that she’s better informed than her critics. I’m beginning to think she’s actually doing this on purpose. Love the fake outrage as liberals castigate Palin for not giving the speech they’d have made. Where does Palin take responsibility for the gun sights trained on the districts of Democratic representatives, including that of Giffords? Where was Palin’s concession that perhaps “Don’t retreat — reload!” might not have been the best way to get her point across? Where is this columnists acknowledgement that such target maps are perfectly common and normal and in no way contributed to this tragedy? What that ignores of course, is that there was no “chain of evil”. Palin’s agressive politics had nothing to do with the shooting and everything to do with winning political races. What is a “chain of evil” is the way that every time the left is found to be wrong, they find something new to complain about. A chain which this particular columnist contributest to in several ways, including repeating the liberal nonsense about blood libel. This was a missed opportunity by the ex-governor. She could have used this moment to grow in stature and look as though she had it within her to lead more than a conservative moment — that she could lead an entire nation. Instead she chose to toss aside the opportunity for statesmanship and lashed out bitterly while throwing red meat to her base. I was surprised at just how restrained Palin was. Much has been made about how she made it “all about her”, yet she in fact said almost nothing about herself. In the always churning and swirling turmoil of politics, prominent figures can both ride the wave and be swept under. But Palin’s arrogance, sense of entitlement and narcissism were on full display in her video message. She wants to be president, and she has shown that she can be plenty tough and unyielding in her principles. What she has also always shown in her defensive swagger is a complete lack of humility. I thought her speech was very measured and pitched about right. I saw no arrogance, no sense of entitlement or narcissism. Since when has it been narcissistic to ask people to stop libeling you? Since when do we describe people as having a “sense of entitlement” because they ask people to stop calling for their death? Since when has it been arrogance for a political leader who has been the subject of an unprecedented tidal wave of hatred to ask for that hatred to end? And (he repeats for the umteenth time) all this during a time when the left tell us that words hurt. The columnist wants Palin to back down. Yet the columnist himself by writing the column is defending others who refuse to back down, repeating slander that should have been repented of yesterday, or even better, not made at all. The left have had it easy for a long time. They screamed and the right backed down and apologised. (Exhibit 1: How McCain had to walk over eggshells lest he attract charges of “racism”, which have been oh-so-common post election.) The result of this long-term has been the liberal takeover of a nation where big government is ruled out by the highest law in the land. The Tea Party is about ending that constant capitation, and taking back America. The left’s response has been to use hijack a tragedy, and use that tragedy to up their rhetoric. They know (or rather think) that eventually, sooner or later, the right will have to either fold or sink to their level and then they’ll be victorious. As this columnist shows, their faith in the MSM to keep their back and ignore their hatred is well founded. Sarah Palin has shown that she is not going to back down. The entire point of saying “don’t retreat, reload” is that you don’t retreat when people throw more hate at you, when the opposition increases. On the other hand, the entire point of saying “I wish Palin was dead” is that you wish Palin was dead. Via Twitter, this WSJ essay from a Jewish Rabbi. Emphasis mine. Despite the strong association of the term with collective Jewish guilt and concomitant slaughter, Sarah Palin has every right to use it. The expression may be used whenever an amorphous mass is collectively accused of being murderers or accessories to murder. The abominable element of the blood libel is not that it was used to accuse Jews, but that it was used to accuse innocent Jews—their innocence, rather than their Jewishness, being the operative point. Had the Jews been guilty of any of these heinous acts, the charge would not have been a libel. A point that’s completely and utterly ignored by the left is that Palin has been libeled and viciously so. But when the victim points out a crime has been committed against her, they attack again than rather apologizing. And all this during a debate about the toxicity of political rhetoric! Murder is humanity’s most severe sin, and it is trivialized when an innocent party is accused of the crime—especially when that party is a collective too numerous to be defended individually. If Jews have learned anything in their long history, it is that a false indictment of murder against any group threatens every group. As Martin Luther King Jr. wrote in his Letter from Birmingham Jail, “Injustice anywhere is a threat to justice everywhere.” Indeed, the belief that the concept of blood libel applies only to Jews is itself a form of reverse discrimination that should be dismissed. From many of the media reports, I have a sneaking suspician that a lot of the people who are calling Palin ignorant only know about the term because they had a quick read of Wikipedia. In fact, if you believe NewsBusters, they haven’t even read their own archives. IN LIGHT OF ALL THE DEMANDS THAT CERTAIN PEOPLE WATCH THEIR LANGUAGE, I’m reminded of how many people got their knickers in a twist over Ari Fleischer’s “watch what you say” remarks after 9/11. Fleischer’s remarks were pretty innocuous in context, but you would have thought he was Big Brother with a truncheon from the reaction of . . . well, Paul Krugman, who is now saying much more along those lines than Fleischer ever did. What could be different now? (Thanks to reader Paul Ulrich for the reminder). Fleischer suggested that extreme retoric wasn’t wize and it was contorted into some sort of big government threat. JAMES TARANTO: Big Lies And Little Ones: Paul Krugman’s Only Example Turns Out To Be Fraudulent. “If the broader claim–that the ‘rhetoric’ of Republican politicians and the nonliberal media was to blame for last Saturday’s act of mass murder–is true, why can’t it be presented without false factual assertions? Krugman’s little lie undermines the big lie he and his newspaper are attempting to purvey.” Plus, Jonathan Alter’s monstrous opportunism. “Alter seems to be lacking in any sense of decency.” And is refudiated by Rahm Emanuel. See, this is why a conservative like myself has such a vastly different view of the US than anyone on the left. I know for myself that I am on the same wavelength as many of these supposed “hateful” people, so when I see something that doesn’t sound right, I check. And in so many instances they actually turn out to be completely fake or reasonable quotes distorted and taken out of context. So it’s actually articles like the above which drive me to the right. If your case consists of only one quote, and that quote is fake, you’ve failed. Sadly, most people think that religious conservatives in the states are bat sh*t crazy and don’t bother. Not that there aren’t crazy people, and that good people don’t occasionally say stupid things (eh, Obama – still bringing that gun?). As a tangent, I doubt very much this will damage Palin. She became popular through just such a torrent of irrational criticism – in spite of it. Why on earth do those who’s earlier lies failed think that one really big lie will do the trick when thousands of smaller ones failed? I just thought I’d go on the record here. I do not agree that the famed Palin political map contained “Surveying Markers” or any other such thing. They were targets. The races were targeted. That’s why she used a target*. I know people have a problem with that, but I believe this fellow has something of a point. Though I don’t think he gets the irony of calling “wingnuts” stupid, while being to dense to understand why they’re pointing out his statement. *I read that they were never intended to be seen as cross-hairs, but that’s not really that relevant to the point at hand. Saw a few tweats on this the other day and wondered “what’s up with that?! ?” – twitter being what it is, detail isn’t exactly forthcomming. This is getting to be a familiar pattern, so much so that maybe we need a tag for this. It goes like this. First Sarah Palin says something perfectly reasonable, showing what I consider to be at least average intelligence and knowledge. Then a liberal, being less knowledgeable than her on the subject at hand, mistakes his or her own ignorance as evidence of Palin’s stupidity and in the process manages to look stupid themselves. I mean we have the “Party like its 1773” example, and Gawker’s previous snark fail. And now we have Richard Wolffe. The 1773 one was probably the most extraordinary. The fact that people assumed she had the wrong date of the American revolution (when she was of course referring to the original Tea Party) and didn’t even bother to check with google before they prounounced her stupidity says a lot about certain members of the media. Actually, the Gawker one was also pretty funny, given they had failed to read their own links on the very law they were lecturing Palin on. Heh, costly mistake! This is the sort of stuff that happens when you believe your own spin. Almost daily, it seems, some liberal moron criticizes Sarah Palin for being stupid — and then gets shown up. To take one recent and memorable example, she was taken apart for telling Tea Partiers to “Party like it’s 1773.” Stupid Sarah Palin! The Declaration of Independence was signed in 1776! Except that, er, the Boston Tea Party (which inspired the Tea Party movement) occurred in . . . 1773. By now, you’ve guessed the punchline. Palin’s publisher Harper Collins sued Gawker, and a judge pretty much instantaneously ordered Gawker to pull down the excerpts. Next comes the part where Gawker pays monetary damages. Let’s just say there’s a reason why you should always read the links you post and leave it at that. From the Herald, on Palin’s inaugural stint on Fox. So didn’t look like a parody of an interview that was edited to make sure she looked stupid? The CBS interview wasn’t her best moment, but likewise, that station also went out of it’s way to trip her up. Heh, here’s a good one. There’s been so much Palin bashing lately, due to her new book. The Tonight Show got William Shatner on to read some of the more odd entries (taking them out of context of course) therein. What Shatner didn’t know is that it cuts both ways. However, Shatner was a good sport and saw the joke. I wonder how many other critics could do that – some of the criticism of her has been absolutely toxic.